Premium by design, these acoustic strings constructed with 80/20 (80% copper, 20% zinc) bronze wrap wire boast a crisp, bright tone with an expressive, vibrant presence. Compared to Elixir's original POLYWEB Coating, the ultra-thin NANOWEB Coating allows a more traditionally textured, “uncoated” feel. For a slicker, gentler feel, try the original POLYWEB Coating on their 80/20 Bronze Acoustic Strings, which also feature a more robust and rounded tone. 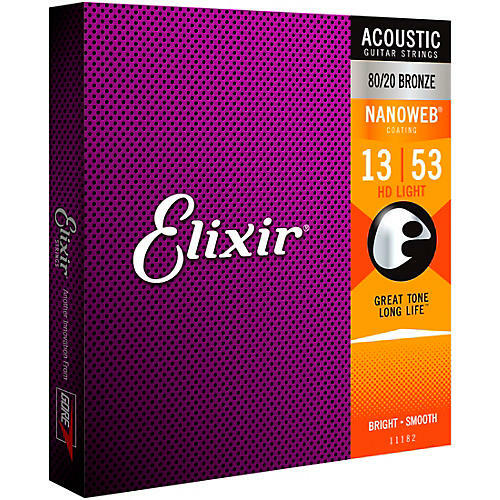 For more of a balance between bold and bright, Elixir's Phosphor Bronze Acoustic Guitar Strings with NANOWEB Coating deliver full-bodied tone and sparkling high-end clarity alongside the same traditional feel as these 80/20 bronze strings. Of course, the kind of string you play is all a matter of personal preference. Not sure what tone or feel is right for you? Try them out for yourself, and find your new favorite string from Elixir Strings. For a more in-depth look at what makes our strings so special, scroll to the branded info further down the page.